This easy weeknight dinner may look time-intensive, but it only takes 25 minutes to make (using just four ingredients)! This easy weeknight dinner may look time-intensive, but it only takes 25 minutes to make (using just four ingredients)! 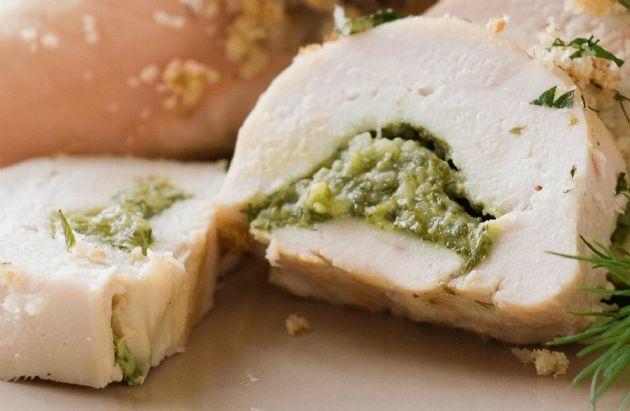 Cut a deep slit into middle of each chicken breast sideways to create a "pocket". Mix together the ricotta, mozzarella and pesto, Stuff 1/4 of the mixture into each breast. Grill for approximately 15 minutes. (Can use a Foreman grill though I prefer a gas or charcoal grill.) Serves 4.